The strike has the capacity to enlarge collectivism and deepen critical thinking, but it has also revealed that striking in an academic context is far from straightforward. First published at Discover Society. 1. The number of days lost to strike action in Britain currently sits at a historic low. And yet, from this undoubted position of weakness, the 2018 university pensions dispute has shown that the withdrawal of labour still carries tremendous leverage. For six months, the University and College Union has tried to bring the employers back to the negotiating table over proposed changes to pensions. After just 48 hours of strike action, "talks" were resumed. If sustained, the strike may yet yield a victory for staff and see the retention of the defined benefit scheme. 2. 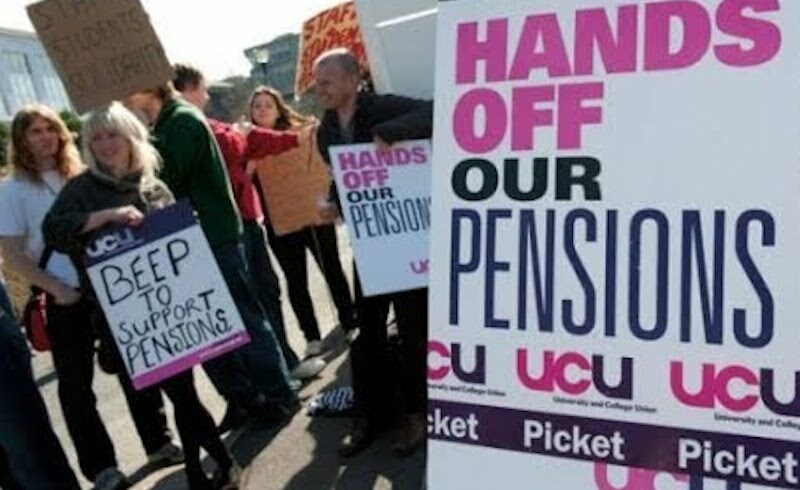 The university pensions dispute has also underscored the transformative capacity of strike action. Entrances to buildings — once in-between-spaces — are suddenly redefined as sites of radical education. At "teach outs" and picket lines across the country, the question of pensions is being located in a much wider conversation about the nature of the university and the marketization of education. The strike, in short, has revealed itself to have the capacity to enlarge collectivism and deepen critical thinking. 3. But it has also revealed that striking in an academic context is far from straightforward: what does it mean to withdraw one’s labour as a university lecturer? It is one thing not to teach a class, quite another to refuse to think. When so much of an academic’s "working day" spills over into evenings and weekends, it becomes harder and harder to identify the picket line, let alone choose not to cross it. The reality is that thousands of striking university lecturers have likely used this period away from work to write up their research. All of this demands that we rethink what collective action might look like in higher education. 4. This is made all the more apparent when casualised labour is brought into the conversation. A decade ago, teaching assistants and "zero hour" lecturers did not even occupy a place in the union’s imaginary. Now that planet precarity has been identified in the academic universe, there is at least an established discourse around casualised labour. But the strike over pensions only underlines how desperate the situation now is: as much as 75% of the teaching is delivered by staff on temporary and insecure contracts in some universities. Many of them are not even able to pay into the pensions scheme they are striking to defend. For the most exploited, isolated, and precarious layer of the strike’s social base, the real concern is whether a stable, secure income will ever be found, not just in retirement, but in the here and now. Furthermore, those left to pick up the pieces of this conflict are often overworked, under resourced administrative staff, who are the first point of contact for students concerned about the fate of their education. Their place in this dispute needs to be made more visible. 5. A not insignificant number of those PhD and early career researchers currently undertaking strike action were undergraduates during the student revolt of 2010. This is Generation Millbank, and it serves as an important reminder that the movements of the past have their political returns in the present. 6. But defeats also have their returns. During the strike staff have encountered students who simply do not know what a picket line even is. It is surely one of Thatcher’s greatest victories that forty years after her election, large sections of young people today lack even a basic vocabulary of industrial action, let alone any experience of it. In this sense, and as others have argued, it is perhaps the transformations of the 1980s rather than the austerity programmes since 2008 that bear heaviest on our present moment. When set against this backdrop, the defence of pensions represents a vital attempt to halt the long-term reversal of the postwar social democratic consensus. 7. As is now clear, Higher Education is no longer inoculated from the most familiar manifestations of the neoliberal era: self-reliance, individualism, free-enterprise, altruism, personal advancement, and "competitiveness" are all now inscribed in the university experience. The introduction of student fees has been played the key role in accelerating these developments. On the picket line some students have insisted, understandably so, that while they support lecturers’ demands, they do not want to jeopardise their own "personal investment." This is the reality of twenty first century education: students are literally paying customers. Again, this demands a careful rethinking of what collective action in the academy might look like. How, for example, can students be encouraged not to think of their education in purely commodified terms? 8. The centralities of race and migration within the university sector have also come into full view during this strike. For many students, especially those on Tier 4 visas, not crossing the picket line enlarges the threat of deportation. If the university is to become a more democratic space, the strike needs to be more attentive to the ways race, borders, and nation are reproduced within higher education itself. A strike campaign that does not incorporate these students’ concerns will fail us all.